Whimise I Love NY and Essie Power Clutch, Here is another Whimsie and this one is I <3 NY. This was a no brainer for me to get because even though I'm from NJ and not NY I have always loved this city and have so many special memories with my husband and family members spending time there. 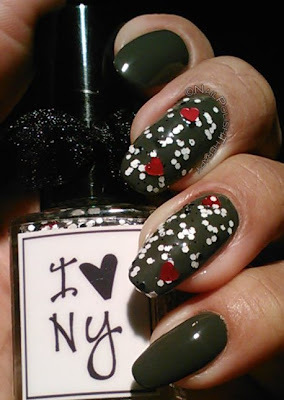 This is a polish that mimics the iconic I <3 NY t-shirts and mugs that are all over the city. 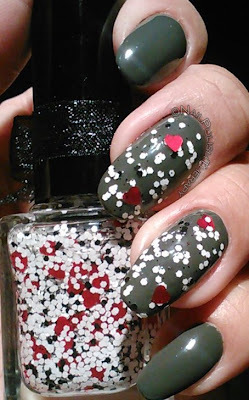 Clear base with black and white small hexes, and red hearts (of course). This was very easy to apply and in each removal of the brush I got at least 2 hearts which was nice because I didn't have to go fishing for them. I did 2 accent nails of I <3 NY over Essie's Power Clutch. 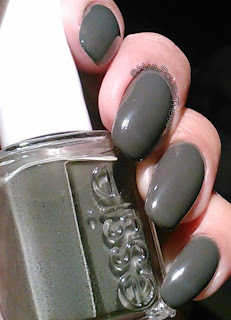 That polish was thin (like most Essie polishes) and with a heavy hand I had full opaque coverage in 2 coats. Here you will see the shiny and the matte version. 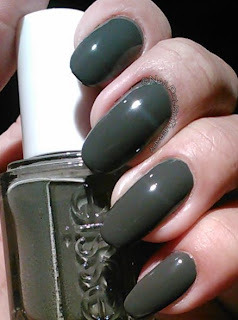 I preferred the matte as it reminded me of concrete in the city.